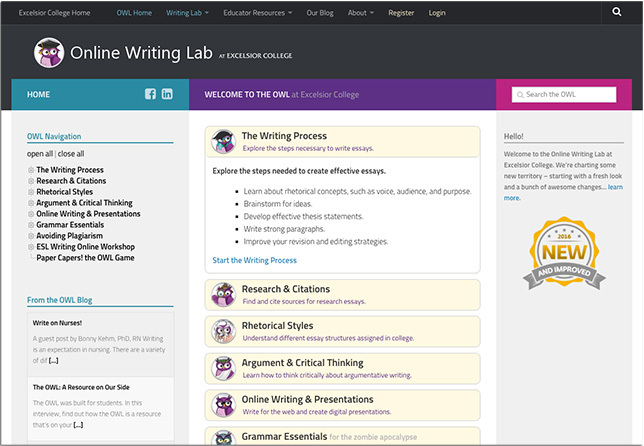 Thanks to a two-year, $300,000 grant from The Kresge Foundation, Excelsior College is expanding the reach of its Online Writing Lab (OWL), a publicly available interactive website designed to help students improve their writing skills. The college plans to focus on promotion and growth for OWL, including presenting the resource at national conferences, conducting industry webinars on writing topics, and helping other institutions integrate OWL into their curriculum. "This grant will fund a systematic outreach plan and, ultimately, help more low income and underserved populations improve their writing skills and grades as they pursue a degree," explained Francesco Crocco, director of the OWL, in a statement. In fall 2013, the Evaluation Consortium at the State University of New York at Albany conducted an independent pilot study evaluating the impact of OWL at six higher ed institutions across the country: Excelsior, Valencia College, Howard Community College, Broome Community College, Union County College and San Diego Mesa College. The researchers found that students using OWL increased their final grades by 6.5 points compared to a control group; students showed the greatest improvement in the areas of genre and disciplinary conventions, control of syntax and mechanics, and sources and evidence. OWL is currently in use on more than 20 college and university campuses, including Massachusetts Institute of Technology, Walden University, Rochester Institute of Technology, Purdue University and Thunderbird School of Global Management.